Aspire Archon TC Box MOD is constructed in zinc alloy material and powered by dual 18650 batteries, the max out put up to 150W, features the embedded chipset and child lock and special button function. 150W Aspire Archon TC Box MOD is constructed in zinc alloy material and powered by dual 18650 batteries, up to 150 Watts. The rounded design make Aspire Archon Mod smooth and comfortable to hold, also comes with many unique function. Aspire Archon features the embedded chipset and child lock mechanism, you can set a password before the mod can be fired up. The biggest difference of Archon box mod to the other box mods is its extra buttons function, the “W” and “T” buttons allow you to access the variable wattage mode and temp control mode respectively, with a press of a button. The extra buttons allow you to bypass the menu for basic functions while at the same time it allows you to access the advanced options with a press of combination buttons. Not only this mod can access advanced options with ease but also can customize things like the logo on the 0.86-inch screen. • It doesn't include any batteries. Arrived promptly and in perfect condition, love this mod, having the extra by battery on board means it'll go all day and night without the worry of being out and it conking out on me. Good design and easy to use as all aspire products are. A lot lighter and more comfortable to hold than the Pegasus it replaced. 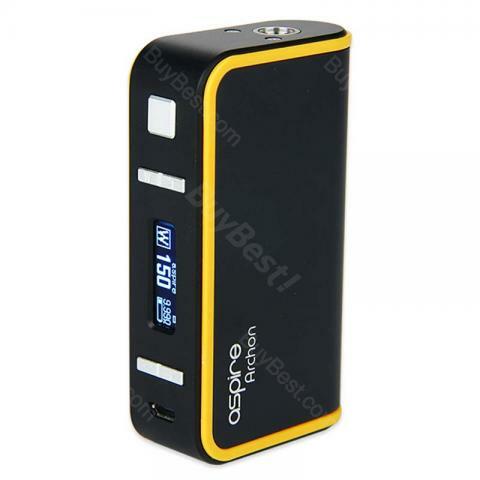 The battery and quality of 150W Aspire Archon TC Box MOD is excellent, Flavor and smoke ratio is just fine. Hand over it. Aspire Archon ist super verarbeitet und der Akku hält auch locker 2 Tage bei gelegentlicher Nutzung. Der Geschmack der Liquids is auch gut. nicht zu stark und nicht so schwach. Auch die Rauchentwicklung ist top.